“come and see” to “go and show”—the power of penetration evangelism. Impose a cell structure upon a congregation that has not yet made these philosophical shifts we are likely to fail. But when people adopt these biblical mindset changes, the cell approach will seem natural, and will result in great unity and effectiveness. The Church In Many Houses will help congregations make the changes that are necessary for success. This book is written by a practitioner. Steve Cordle is growing the kind of church he is writing about: a missional congregation that is committed to developing fully devoted followers of Christ through cell groups. This is a fine volume for those who want to grow a church both spiritually and numerically. I highly recommend it. "The multiplication of cells is God's idea-we see it all throughout nature. So I can imagine God's incredible pleasure in seeing groups of cells multiplied to reach, disciple and expand His Church. Leaders will benefit from Dr. Steve Cordle's careful research, practical experience, and deep passion for cell-based churches found in The Church in Many Houses." Steve Cordle has set off within me a hunger to explore the cell church. Steve shares his call and journey of leading the CrossRoads UMC, an effective growing great commission church, through a transition to an even higher efficient cell based church. I would encourage every pastor of a growing program based church to prayerfully read steve's journey and ask the question, "What kind of church do I want to give my life to?" Steve Cordle has set off with in me the hunger to explore the cell church. As the pastor and DS of program based churches, I am challenged by this journey and left wanting more. Steve Cordle works hard to answer the "Why" question about becoming a cell based church. This is not just the next hot thing. Yet, with in this book you not only answer the why question, Steve shares great steps into the "How" question of becoming a cell based church. Steve has opened my mind and heart and planted a hunger within me to begin a quest toward the cell based church. If you are searching for a practical way for the local church to build on the priorities and practices of Jesus Christ, then this book is a must-read. Steve Cordle writes: "I can't say I caught the vision of the cell church; rather, the cell church vision caught me. I couldn't shake it." 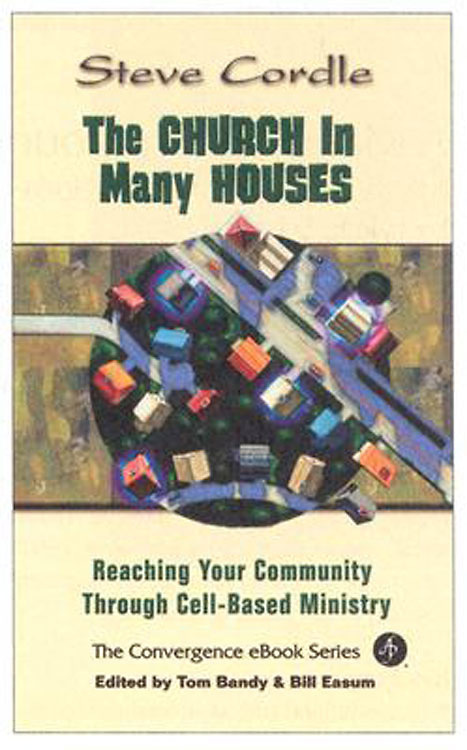 This dynamic book, The Church In Many Houses: Reaching Your Community Through Cell Based Ministry, brilliantly illustrates how the cell church vision caught Crossroads UMC. Having visited Crossroads UMC, Steve Cordle leads one of the most exciting cell churches in the <?xml:namespace prefix = st1 ns = "urn:schemas-microsoft-com:office:smarttags" />U.S. Steve has many gifts: a knack for keeping things simple, a humble heart that permeates his story, and enthusiasm that keeps you reading. Enjoy the journey! A long time ago, a small band of disciples proved that authentic, evangelistic, Spirit-led community can change the world. It's happening again. Steve Cordle writes winsomely of what is beyond worship attendance and outward compliance. His eye witness account of inner transformation through the cell church ministry of Crossroads United Methodist Church will inspire all who tire of program-loaded church life. But be careful as you read this book, it could change the entire way you see and do church. Steve Cordle has captured the heart behind the success of the New Testament Church ... The life of the body is in the cell.